With the recent reviews on shavettes by Paul and Trevor such as the Equinox and Sanguine respectively, I thought I’d share a few words. Having been shaving with straight razors for a number of years, I purchased my first shavette back in 2013. This was a Parker 31R shavette, which is one of the most popular choices among enthusiasts. Today, it is more commonly known as the SR1 but is pretty much the same razor. After 5 years of use, I would like to break down my experience in a review. Although it’s been many years since I bought my Parker 31R, the ones sold today on Amazon are almost identical aside from the name. As Parker have grown in popularity, they have realised other models and the SR1 itself was cosmetically updated. Those changes involve added their logo rather than the ominous “hygeine quality shaver” written on the side as well as more refined details on the metal itself. Otherwise, the razors are identical. 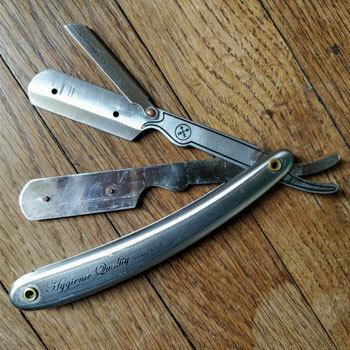 Being my first shavette, it has gone under considerable neglect since I moved on to traditional straight razors. For a couple of years, it sat at the bottom of a drawer in the bathroom. The environment was humid and it would regularly get knocked about. As such, it has experienced a little wear. However, you’ll that that in the pictures, the scratches are mild given the punishment it endured. As for the build quality, it is constructed entirely out of stainless steel with copper and brass rivets for the scales and clasp respectively. Overall, the razor is very well balanced and its meagre 48 grams feel solid in the hand. Although I didn’t purchase this one recently, I actually already own a few Sharks Super Steel blades that come with the razor when bought on Amazon. I’m quite fond of them and they’re actually my choice razor blade next to Derby Extras. In fact, these razors are ideal for beginners as they’re very mild yet offer a sharp and smooth experience. If you’re interested, you can see all our favourites in our safety razors blades guide. With your order, you’ll get 5 of the Sharks single-edge razors. Although this isn’t much, it should be enough for at least 10 good shaves or more if you’re persistant. It’ll also give you the opportunity to try them out and see how you find them before buying more. When the time comes, you could refer to the guide linked above or grab some Derby Premiums, which are specially designed for shavettes. As we cautiously outline in our introduction to shavettes, these types of razors are a popular if slightly risky choice for beginners. Given that you don’t have to sharpen the blades yourself, it may seem logical that they’re ideal for getting started. However, their blades are much more unforgiving than straight razors and can be quite painful for a first attempt. I actually made the same mistake 5 years ago and irritation and razor burn very often until my technique eventually improved. When I switched to real straight razors, I found that the learning curve was much softer and I wondered why I didn’t try them in the first place! However, I was more-or-less on my own and I didn’t have the benefit of a comprehensive shaving guide to accompany me. Nevertheless, if you are certain that you want to start straight razor shaving with a shavette, then I would recommend the Parker SR1 before any other. The blade exposure is much less than other shavettes and its construction is well-built with a thoughtful design and ideal balance. The blades fit tightly into the clasp and you’ll experience some good tactile feedback rather than undesirable vibrations. I guarantee that overall shave will be very smooth, but be sure to keep your eye on the shaving angle lest your want your skin to turn bright red. The Parker SR1 is slightly more expensive than the other razors featured in our best shavettes. However, I personally believe that it’s the perfect choice for beginners. With a good balance, ideal weight and very durable construction, this razor can accompany you for many years as you improve your technique. Although the cost may sound steep at $73 on Amazon, it actually offers superb value for money as the individual items will each cost much more separately. For instance, a pure badger brush can cost the asking price for the kit alone! Reviewed by Charles-Philippe, on March 3rd 2018 . "A companion of many years. The Parker SR1 was my first ever shavette and still continues to perform today!" Charles-Philippe, I was considering getting into straight razors with a Parker shavette but your comments on the learning curve worry me. Should I just go for a traditional straight razor? I think that’s largely a personal choice you’d have to make but I can argue either way. The advantage of starting with a shavette is that they’re cheap and easy to maintain as you don’t need to learn to strop. However, they’re harder to shave with and less forgiving. We’ve actually written about this in detail. Check out our full Straight Razor Vs Shavette guide to help you decide!